Here is our version of Anne's beautiful prayer activity for the month of July dedicated to the Precious Blood. I wanted to find a beautiful gold chalice but couldn't so decided that this one would do the trick. I covered some boxes with a piece of red fabric and my grandmother's mantilla. You can see Anne's here and find her link to all of the beautiful prayers she posted a few years ago. And check out this post from American Papist where you can see Anne and hear her sweet voice too! What a great idea. I must admit while we have an alter in our home with various saints, rosaries and such I'm not in the habit of changing it to coincide with the liturgical calendar. We don't have children yet (trying to adopt), but regardless it is something we should do and something to get into the habit of doing before we do have children in our home. I just found your blog today, and I'm happy I did. 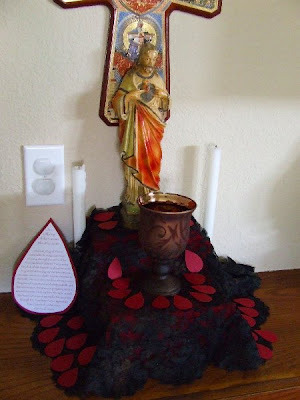 Charlotte your Precious Blood altar is WONDEFUL!! I've very inspired by that set up! I'm so glad so many of my friends could put a voice/face to a name, you imagine my curiosity as well, I reckon everyone ought to do a 35 second video and upload onto your blogs, I just hope you don't have the brain strain that I suffered in doing that s-i-m-p-l-e thing! VEry nice Charlotte! 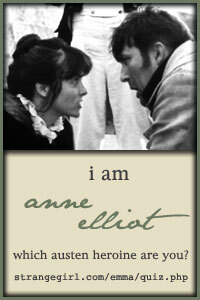 Is'nt Anne wonderful for sharing her inspirations with us? I love the look of yours as well. I love the look of your Altar. We are still setting up our bookcase display, this is different to our family Alrar. I always love your ideas and often adapt them to our family. I am still adding my Chasuables too. 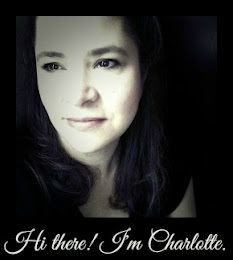 I love it, Charlotte! It's absolutely beautiful!!!!! Your altar is really beautiful, Charlotte! Thanks for your inspiration, and a link to Anne's blog, too.